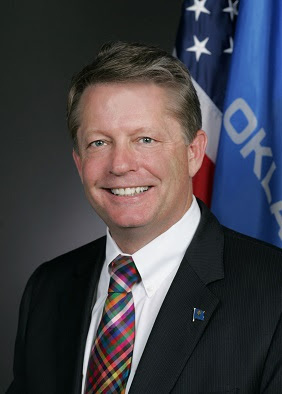 Oklahoma Labor Commissioner Mark Costello was stabbed to death this evening in Oklahoma City. News reports say that Costello was meeting with his son at Braum's on North May Avenue in an attempted reconciliation effort, when the son attacked Costello with a knife. Costello was first elected in 2010, and was re-elected in 2014 by a wide margin. He was dedicated to his work as Labor Commissioner. 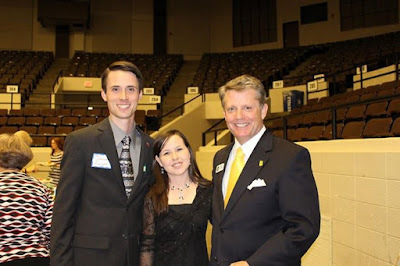 A true friend to the Republican Party grassroots, he traveled the state extensively, attending GOP events and helping local candidates. Below is a photo of me and my wife with Costello, at the Muskogee County GOP's Lincoln-Reagan Dinner in 2014. Costello had a knack for the personal -- he could always remember minute details about people he came in contact with. He sent us a handwritten card when he found out my wife was expecting, and a real Republican gift (an elephant pacifier) for Carmen after she was born. Mark Costello will certainly be sorely missed.